It should be an axiom nowadays that content management is essential to success with your website. 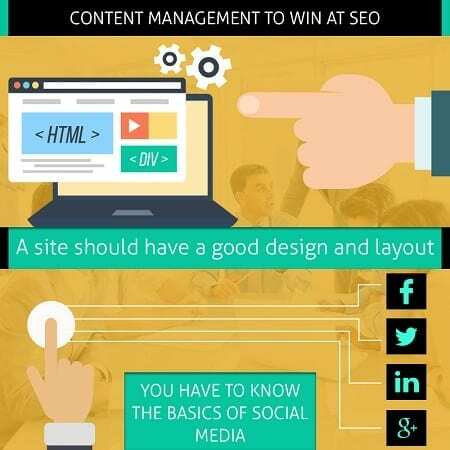 SEO is important, the technical engineering of your site are the primary things, but do not underestimate the ways you can engage in content management that wins the game. First of all, your site has to work properly. A good design and layout, categorized areas of the site that is easy to access with clearly visible links. Your foundation is what you will be building upon so do that carefully. Next is the icing on the cake: content management. When you’re doing content management you’re being both artist and scientist. The bottom line is, if people aren’t attracted and interested in your content, you’re wasting time and money and opportunity. The point to having a website is to do commerce and trade via the web. You may be in a niche where there’s lots of competition. If this is the case, your website has to stand out and be of such interest that it not only converts but retains surfers. In order to get their attention, you’ll have to employ some tactics that are safe and equitable. Never try to scam Google. Their software is top notch and will detect fraud and deception and then they’ll drop the hammer. You want your content to be lively and to invite action and interaction. At first sight, your surfers should see that your site has what they’re looking for. Don’t cram tons of info on the first page. It only confuses the surfer and they’ll rabbit. Using a strong, identifiable graphic or picture with your brand name stamped in prominence. Use a catchy slogan to let the surfers know you’re a business with a heart. You’ll be dealing with two types of surfers, the hard-bit know-it-all, and the gotta-have-it-now person. Both are willing to buy but they have to be convinced. If your site is just bland with let’s say, a picture of a wrench to symbolize that you own a fix-it store, then that’s simple and does work, but not to the levels that you would desire. You want to dominate, not just populate. Advertisers overcame this issue years ago with something very simple: bathing beauty models. Yes, the old use of a pretty woman in a bathing suit or lovely gown still works. You might have some ‘splainin’ to do but it works. Happy animals, historical figures, any visual gimmick you can think of should enhance your efforts in a positive direction. A huge part of content management and SEO is knowing how to use links. Never join some linking scheme, only supply links that lead to pertinent and helpful information. You don’t want your surfers running off to another site, what you want them to do is have access to material that enhances their experience at your site. Inbound links should only come from authoritative sites. This will boost your SEO chances with minimal chance of Google penalizing you. Social media skills are mandatory in today’s content management and SEO games. Whether you like it or not, you’ll have to know the basics of social media and you’re going to have to keep up with the latest changes. It can be confusing and overwhelming so you need to take it slow. You can outsource some social media chores but the key thing is to incorporate the technologies and techniques of social media interaction into your website. Overall, you’ll need to just make your site competent, user-friendly, and entertaining. You want to attract, convert, and retain. This is what the future of SEO calls for, not tricks and gimmicks. Honesty is the best policy regarding SEO and content management.